ROME, Nov 12 2018 (IPS) - Despite the fact that Pakistan’s industrial and services sector continue to grow in importance, what happens in the agriculture sector remains critical to the performance of Pakistan’s economy and the wellbeing of its people. 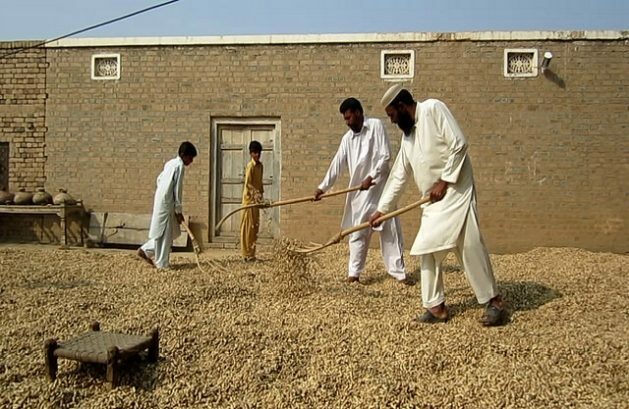 According to data by the Government of Pakistan almost 60% of the country’s population live in rural areas. For most of them agriculture forms the basis of their livelihood and spending on health, education, housing and clothing are critically dependant on the performance of the sector. Poverty also tends to be more concentrated in rural areas and, as a consequence of the migration of many young males to urban areas, the bulk of tasks in agriculture and related rural activities are now carried out by women. Better agriculture performance therefore also means greater wellbeing for a large segment of the population, less poverty and more money in the hands of women – something that is critical in bringing about a more gender balanced society. In recent years the performance of agriculture has been lackluster. Since 2011/12 growth has averaged only 2.4% per year and in 2015/16 the agricultural GDP actually fell for the first time in Pakistan’s history. This resulted in strong protests from farmers and rural populations about the low priority given to agricultural and rural development by the outgoing PML-N government. Pakistan does not have a national level Ministry of Agriculture or of Rural Development. Most of the responsibilities for agricultural development have been devolved to the provinces as part of the decentralization process that started in 2010 under the 18th Constitutional Amendment. However, there is a Federal Ministry for National Food Security and Research (MNFSR) and it has a critical role to support and guide agriculture development across the four provinces. In addition, a number of key policy levers related to trade, tariffs, support prices and regulations related to seeds and fertilizers remain under their control. A new minister, Sahibzada Muhammad Mehboob Sultan, was appointed to the MNFSR in early October. The new Minister has an important but uphill task ahead of him. This should not daunt him as many of the critical elements of an action plan are in place and it needs some strong political lobbying to get things moving. More critically, as argued below, what he does will not require is more money and in fact a review of the current subsidies may actually reduce public outlays – something for which his counterpart the Minister of Finance will be grateful in these tough times. First, operationalize the National Food Security Policy. A new National Food Security Policy was approved at the end of the tenure of the last Government – just before the dissolving of the assemblies. The new Minister should not see the National Food Security Policy as a legacy document of the previous regime. The Policy has taken several years to complete and the exercise has been consultative and holistic, with strong involvement of the provinces, development partners and other stakeholders. It provides the necessary framework for visualizing the role of agriculture and food systems in the production and consumption of adequate, safe and nutritious foods without compromising the country’s natural resources while at the same time improving the incomes of vulnerable populations. The new Minister should focus on translating the Policy into action. The focus should be on better managing trade and pricing policies – in particular liberalising trade in products such as wheat and sugar which are important to the poor and which can be imported at low prices, and, at the same time freeing up domestic markets for fruits, vegetables and livestock which are still subject to government monopolies and price caps; improving legislation particularly those related seeds and other inputs as well as to intellectual property rights which act as a brake on national and international investment in machinery, equipment and inputs; leading the way on top-end basic research especially with regard to new and emerging issues such as climate change; maintain international collaborative agreements especially with regard to transboundary pests and disease control. Second, support provinces with managing public expenditure in agriculture. Almost all development expenditures for agriculture and rural development are in the hands of the Provincial Governments. Often much of these funds are inefficiently spent with poorly planned projects, slow implementation and high expenditures on recurrent costs, the bulk of which are salaries of support staff. All four provinces have formulated their own agricultural plans and strategies to relaunch growth in the agriculture sector which reflect the growing demand for horticultural and livestock products from the expanding urban population. Public expenditures, both development and recurrent, will play a large role in bringing about this change. The new Minister should work with his provincial counterparts, supporting and helping them with the more technical complex and difficult tasks such as the restructuring of the public services, revamping their research systems and reforms of land tenancy arrangements. Third, advocate for the phasing out of inefficient subsidies. Presently, inefficient subsidies in the agriculture sector, particularly on fertilizers and the procurement, storage and distribution of wheat, curtail its growth potential. By the government’s own admission in the National Food Security Policy document, the subsidy on wheat costs the national exchequer close to 200 billion Pakistan rupees, and should be revisited. According to a recent report by the International Food Policy Research Institute, the gradual phasing out of subsidies could allow reallocation of public funds towards higher investments in rural infrastructure (such as roads and markets), agro-processing, food logistics and distribution, research and development, and extension services. In addition, redistributive policies could provide the necessary impetus for enhancing inclusivity in the agriculture sector through better targeting of social safety nets to smallholder family farmers, leading to improved human and social capital in rural areas. Fourth, foster coordination with other sector and related ministries. Alleviating poverty, eradicating hunger and malnutrition and transforming food systems are challenges that require coordinated and coherent actions across food, healthcare and education sectors. The MNFSR should take on this task , taking advantage of international agreed and supported initiatives such as the national Zero Hunger Programme which integrates agriculture, nutrition and social welfare. Ahmed Raza Gorsi works in international development specializing in food, agriculture and nutrition. Views expressed here are his own. Daud Khan has more than 30 years of experience on global food security and rural development issues. Until recently, he was a staff member at the Food and Agriculture Organization of the United Nations. He has degrees in economics from the LSE and Oxford – where he was a Rhodes Scholar; and a degree in Environmental Management from the Imperial College of Science and Technology.